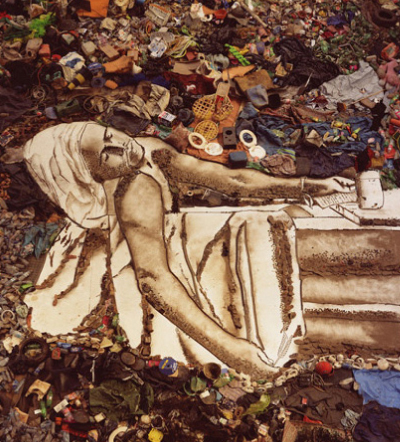 Waste Land is a powerful new documentary that follows Brazilian-born artist Vik Muniz to Jardim Gramacho, the world’s largest landfill, located on the outskirts of Rio de Janeiro, to photograph a spirited group of ‘catadores’, pickers of recyclable materials. The catadores eke out a living in the dump, sifting through endless mountains of ripe garbage, removing roughly 200 tons of recyclables a day. Unlikely stewards of the environment, the catadores reside on the fringes of society — in rubbish-strewn slums, ostracized, and misunderstood. Having built a successful art career using unconventional materials, Muniz arrived in Gramacho hoping to “change the lives of a group of people with the same material that they deal with everyday.” The resulting portraits, reconceived on a grand scale by the catadores themselves using hand-picked recyclables, take on a trajectory all their own, reawakening the lives of everyone involved in the collaboration. Directed by Lucy Walker, (Countdown to Zero, Devil’s Playground) and filmed over three years, Waste Land has been lauded with film festival awards, elicited standing ovations from Mexico City to Tokyo, and, along with Muniz’s photographs, helped raise thousands of dollars for the Association of Pickers of Jardim Gramacho (ACAMJG). A film of deep contrasts, Walker imbues the catadores with a sense of dignity and humor, bringing their bleak lives into sharp focus despite the sometimes overwhelming despair of the landfill. PLANET spoke with Vik Muniz and Lucy Walker about junk, the human factor, and the transformative power of art.